Hawaii is one of my favorite places to vacation. My first time was about five years ago when Paul attended a photography workshop there. To be honest, I had avoided going there before that because in my mind I thought it was going to be touristy and boring (compared to an international trip.) As we explored all the remote parts of the islands I soon realized how wrong I was. It felt exotic like an international trip and there was so many new things to discover but my cell phone still worked! We still had all the conveniences of America like everyone speaking English and not having to exchange money. Now we try to go once a year since we usually find amazing deals out of San Francisco. The pictures below are from one of my favorite experiences. After a long morning hike we went to Waimea Bay in the afternoon to lay on the beach and go swimming. I saw a bunch of people cliff jumping and decided to go. I climbed up to the top of the rock and looked around and the sun was setting and the crystal blue water was down below and the air felt warm. It was perfect! After I jumped I swam out a little in the water and realized I was swimming with a bunch of sea turtles! It was magical and one of those experiences I will never forget. Brought to you by The Hawaiian Islands. Casey @ The Maine Mrs. It is my dream to go to Hawaii! I have never been and hope someday I am able to bring my family. Thanks for sharing these incredible pictures. My husband and I went to Kaui for our honeymoon (almost 14 years ago now). Our kids look at the pictures and want to go, can’t wait to take them. We love going with our family too. Such a great place. That’s amazing! I’d love to live there someday. That’s an amazing story! It must have been so incredible so swim with sea turtles. I’ve never been to Hawaii but I hope my family gets to go soon and experience this magical space. No joking I said the exact same words about Hawaii just the other day! It feels like I am far away, but my cell still works and I can use the American dollar. Too funny! My husband is there now for a “sales meeting” I tried to join him but ticket prices were $700+!! We try and get out there often as Maui is one of our favorite places! Totally! It’s such an easy place to visit! Wow, you are the first person to ever say Hawaii might be boring! I’m glad it turned out otherwise, but I am surprised you ever thought that in the first place. Ocean! Volcanoes! Grass skirts! Come on! Wow, that is quite a jump! Looks like a lot of fun. Gorgeous photos! We had a magical family reunion staying at Sunset beach on Oahu a few years ago. We want to go back to Hawaii for a week at the end of April just as a family of four for some rest and family bonding. Any suggestions would be greatly appreciated! Been to that very spot. It’s beautiful. The water pulls you out and pushes you back to shore. The sand is soft. All the rocks and color of the water are beautiful! My husband and I are actually going to Hawaii on Friday for a belated honeymoon. I’d never really wanted to go there since it seemed sort of cheesy — but when we actually started thinking about what we wanted out of the trip and what we wanted to do with the time, somewhere in the U.S. where we could split our time between off-the-grid adventures and drinking umbrella drinks by a pool seemed just about perfect. It’s perfect for that. Have SO MUCH fun!! wow, that sounds like an absolute dream! definitely makes me want to visit hawaii! love the photos! Wiamea bay and Matsumotos! BEST shaved ice EVER!!!! *swoon! I miss those places! Wow this is just breathtaking! I am hoping to go one day! I just got back from Kauai yesterday! So much fun. Yowza! I’d like to go immediately if not sooner! Living on the west coast, I’ve been fortunate to go out to Hawaii a few times, but I’m always dying to go back. It’s so gorgeous! I spent my honeymoon in Oahu and Maui last June. I figured that Hawaii would be similar to Florida, but I was wrong because it’s so much better! Whenever I think of Hawaii, I think of my husband and I driving around exploring all of the beautiful spots and me with my hand out the car window feeling the perfect breeze outside. I love Hawaii so much and writing that really makes me want to go back! Beautiful pictures. Your post had perfect timing for me. Heading to Hawaii in nine hours and can’t wait! We try to go once a year as well – it’s such a special place. Will have som Matsumoto’s shave ice for you! Glad that you enjoyed your visit to Hawaii. I live here and yes, the sound of the ocean is so soothing to fall asleep to anytime and seeing a part of the ocean no matter where you’re planted on the island. Yes, there’s a few sacrifice in living on an island, but the Islands of Hawaii is like no other place in the world. The international flavors in dining, the culture of Polynesia, Chinatown, snow (yes, we have it here) and surfing (sometimes you can do both in one day), hiking and waterfalls or taking a bus ride around Oahu for $2.50! Each island is unique and glad you were able to sample the Aloha on your visit. Yes, I am living the dream! I’d think the same thing about Hawaii – isn’t that awful to say about a place that is supposedly so beautiful? Ok, then. I’ll put it on my list. Oh my beloved Hawaii. I grew up there but haven’t been back in years–these pictures make me so homesick!! Looks like a few of Waimea (aka my favorite beach on earth). Sigh. We are trying to make it back there this year! Good luck! You won’t regret it. I love Hawaii, the culture and speed of life there is just so calming. I love Ohahu because it’s like having mainland access in the middle of paradise. I can’t wait for my April trip, it was my husbands family tradition to go once a year ever since he was a child, and now that we have a family of our own it has become ours as well. I wouldn’t be surprised if we ended up buying property there one day. I think anyone who lives in the US should visit Hawaii because it’s just a completely different feel than any other state. We usually stay on the North Shore or right on Waikiki, but being big Disney fans, we are finally getting to stay at Aulani. We were actually there the week Aulani opened to the public and ate at the resort then again a year later for their character breakfast buffet, now we’re so excited to finally be real guests lol. But even if Aulani wasn’t there, Ko’olina where the resort is located, is soo beautiful. I can go on forever! I mightve jumped off Waimea rock but last time I was there I was 3 months pregnant! Aloha! I enjoyed reading your article about visiting Hawaii. I used to live in Hawaii and it was my paradise heaven! Waimea Bay was our favorite place to have early am breakfast on the beach, swim, snorkel, and watch the spinner dolphins! One year my aunt came to visit I took her to watch the sunset at Waimea, and we saw a beautiful humpback whale breached out of the ocean much to our surprise! I didn’t have my camera with me I missed out on an awesome picture! I love all things Hawaii! Hawaii is where the Aloha Spirit lives on strong, and will forever remain in my heart and home! 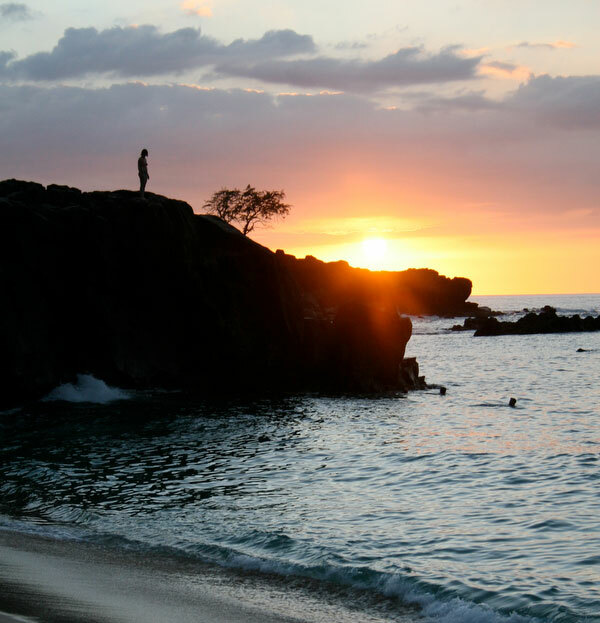 Hawaii is one of my next destinations for sure, specially after reading your blog! thank you so much for sharing!